Fluid-loss tests measure the slurry dehydration during and immediately after a cement job. API offers operational test procedures for determining the fluid-loss rate. Stirred fluid-loss testers can measure the slurry dehydration without having to transfer the cement slurry from a consistometer to the test cell. This removes associated dangers from the process because the laboratory technician does not have to handle the heated slurry and transfer it to the filter press. 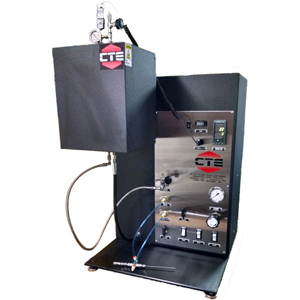 The CTE stirred fluid loss tester has a maximum operating temperature of 450F (232C) and 2,000 psi (13.8MPa).